For those days when you're motivated to ditch the car or the motorbike, a bicycle is a great option. There are so many perks in cycling. To begin with, it’s the best way to dodge traffic. If you want to just feel the wind in your hair or get a little fit, that's fine too. If you're like us and don’t want to jump into the commitment of investing in one, here’s where we would rent our bikes from. Don't forget your ID and address proof before you venture into renting. For those who pre-plan everything, book one at Rentomo from your home or work and rent it out for a day or more. While instant booking might not always be an option the website provides the availability details. Working with lenders who are ready to lend their bicycles for rent, get them nearly anywhere the city, for kids too. Be warned – the specifics of the rental may vary with each lender. Some may ask for deposits, others may not. ICycle has two categories of bicycles – Betta and Parvath (the pricier and fancier ones) – so you can choose the one you need, based on what you want to do (for mountain biking, pick Parvath, of course). If it’s for squad biking, then you can even bulk order. While you can book them online, you have to go pick it up and return it from their location. In case you are too lazy and have cash to spare, you can get them to deliver or pick it up at an added cost. From regular, to mountain bikes, they have got them all. 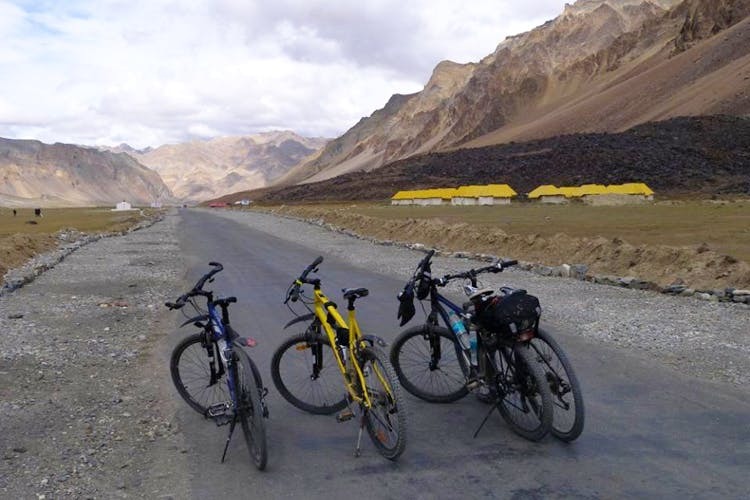 Targeting campers and trekkers, bicycles are just one of the items they give out on rent. So for all your long distant cycling, Pedals and Wheels should be on top of your list. A C-Commerce (Cycle E-Commerce, duh!) venture that promotes cycling, Bums On The Saddle not only offers rental service, but also presents a great platform to interact with like minded people. They unite lenders and renters on their website, where you can choose from various options. If luck is on your side, you will find a bicycle on rent here. Due to popular demand, they seem to run out of the unique bicycles here. So once you’ve got your eye on a particular bike, select it, enquire with the owner and you could rent a bike and have it delivered to your doorstep. Or you could pick it up. They even have an app that could let you rent a cycle at your fingertips. Yet another platform where you can find a bike for rent is Rent2Cash. More of a professinal lend-borrow system, the website provides contact details of someone in your locality, who will (hopefully) lend you their bike. Choose between mountain terrain bikes and hybrid bikes, leave a request for rental or book them online, and you can start packing for your cycling trip. You have to pick it up and return it to their store, since they don’t provide a delivery service. All you need is a glimpse at the website’s gallery to get you booking a bicycle online, to set out on an exploration of your own. They offer only Firefox Target 21 and Btwin Rockrider 340 bicycles but that’s good enough to conquer the city, we think. You can rent them out for an entire month in advance. Whether you're going to a friend's house or to work, look up Yulu zones in the city to know where their bikes are available. Charging INR 10 for the first half an hour and INR 5 subsequently for every 30 minutes, we love that eco-friendly transportation is being encouraged in the city. Get in your day's workout or go shopping and put your purchases in the basket on the front of the bicycle. The government has initiated a public bicycle sharing project. With 3,000 cycles available for use now, the Bangalore Bruhat Mahanagara Palike plans on extending the number to 6,000 bicycles. Using a cycle will cost you approximately INR 10 for two hours, so we suggest turning down the auto drivers of the city and toning your calf muscles instead. If you're in the central business district area of Bangalore and want to get lunch in the area, build an appetite by using Mobycy cycles at a nominal price of INR 5 for half an hour. But we suggest parking them in designated spots as we barely have sidewalks in the first place!